July in the meadow will be all about finding words in response to the space. Even before I head out to High Borrowdale, before its flowers find their full voice, I’m beginning to come across some delicious words. An old language that is new to me is coming back to life. Back in the twelfth century, the Borrowdale Valley (then called Borgheredale) was granted by William de Lancaster to the monks of St Mary’s at Byland. The boundaries were recorded as running from the eagle stone, or ‘Ernestan’ to the plessicum, or slashed hedge. The homestead with its land attached was known as a toft. If words like these do not find their way into verses, bringing the land-made language of the past into twenty-first century mouths, I will be very surprised. 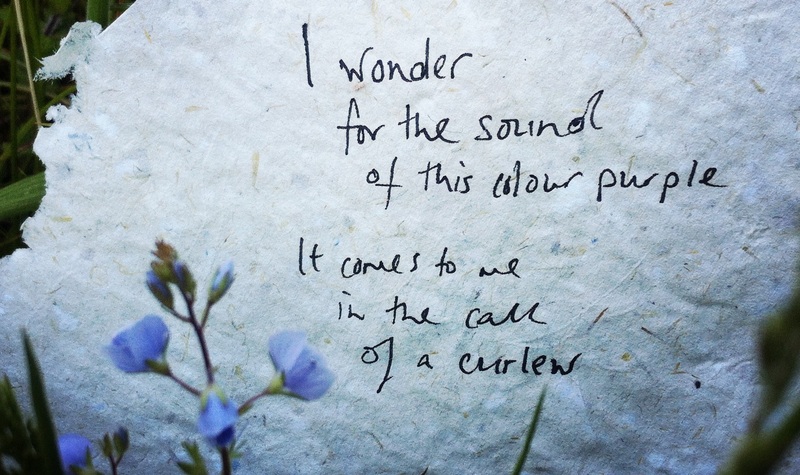 To deepen the sense of landmade poetry I will be making paper and stringing up natural fibre bunting as a canvas for myself and others to write on, as the meadowsong emerges.